Photos above made possible by Polyphony. I have the ECSD-1 (displaced) of this Sprach/Reiner (recorded March 8th 1954) on original open reel. Word has it that these displaced releases were duped in real time from the edited master-being one step before the production master for the LSC-1801 release. The initial mono LM-1801 release came from a single mic U-47 pickup 15 ft above the podium and captured on RT-12 full track mono recorders with tape speeds at 30ips.. I took a two head recorder and modified it for displaced playback since the head spacing were the required 1.25inch apart between tracks. The playback is outstanding with major depth and clarity. This reel release, esp the displaced version walks all over the LSC-1801 and the VICS-1265 release of the same recording in fidelity and quality. So, Monte, were the later releases (i.e., picture boxes instead of text boxes) not duplicated in real-time? My copy of ECS-1 is a picture box, but it still beats the vinyl. Hi, this is the 1st time that I heard that there was a displaced version of tapes, can you shed some more light on it or where can I find more info about it? Thanks. do you sell them? where I can find them? 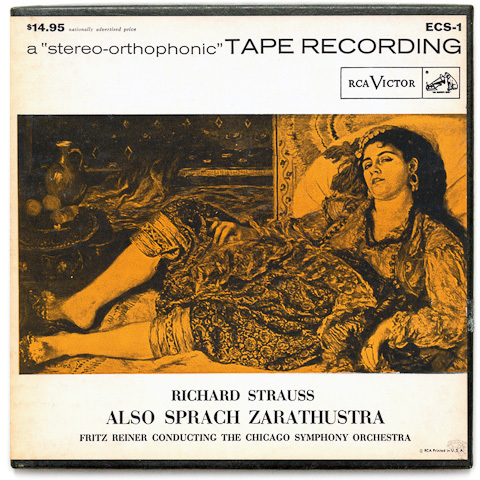 I have 39 RCA Stereo Classical 2 track tapes – if you like I can send you a price list. Hi Kerry, I’d like to have you list if they are still available. Thanks. Keep an eye out! I will be selling my RCA 2-Tracks and some very rare EMI Columbia and HMV 7.5 i.p.s. 2-Tracks on U.S. Audiomart very soon. Will eventually sell off all those tapes, more Classical 2-Track tapes on various labels and many hundreds of London, Mercury, RCA and 4-track tapes on other lables like DG and Vanguard, my username on U.S. Audiomart is ‘hornbaffled’ (I like horn speakers). I also be selling lots of RCA pop titles. hi Kerry, very excited to have a look at your tapes on audiomart!!! It appears that Audiomart.com is undergoing “renovations” at this time. Is there any way to see a list of what you are selling? I would like to see a list of what is available. Possible? Visit my store on Discogs to see a list of 100 audited 2-track and 4-track Classical reel Tapes for sale on EMI HMV, EMI Columbia and RCA Living Stereo-Orthophonic labels. They are all from my personal collection and all have been TESTED and evaluated for sound quality. I am trying to make Discogs a better market place than eBay to buy audiophile reel tapes and LPs. I will soon be listing my RCA Shaded Dog, London Blueback and Mercury Living Presence LPs. Later I will add London STS, RCA VICs and Mercury Golden Import records.